Join us for this one-time opportunity to visit the Cherryhurst House, a Contemporary Art Space located in the Cherryhurst neighborhood in Montrose. 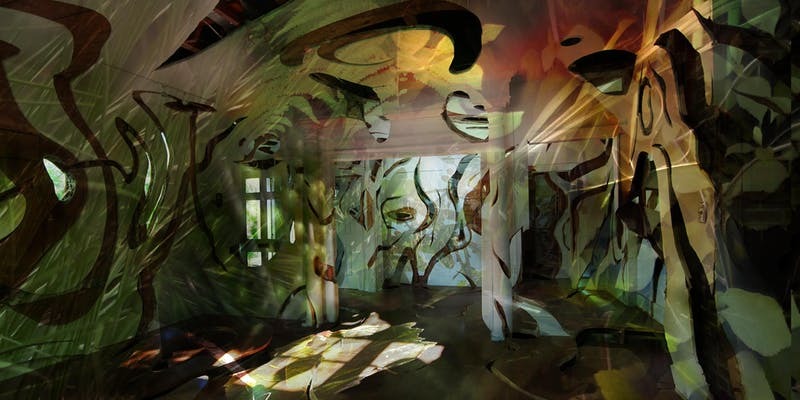 Allison Hunter presents Inside/Out a site-specific video installation in conversation with Ripple, the immersive sculpture by recent Cherryhurst House Artists in residence, Havel Ruck Projects, as a one-night only event. Inside/Out is a multi-channel video installation highlighting the natural beauty surrounding Ripple. Hunter found her inspiration through the exposed layers revealing the long history of the bungalow. In response, Hunter will cover the white walls of the domestic interior with lush greenery in her films of grass, pine needles, and leaves, which we sometimes forget are alive. As Ripple remind us how we grow the spaces that shape our lives, Inside/Out asks us to consider the planted environment that grows with us. Cherryhurst House is a private art exhibition space owned by founder director Dallas McNamara and curated by Barbara Levine and Paige Ramey. Allison Hunter is a Houston-based artist working in video and photography, and Humanities Artist-in-Residence at Rice University. NOTE: Inside/Out video installation loops at approximately 5 minutes, with no set start or stop time. You may enter at any point between 6 pm and 8 pm. Doors will close at 9 pm. Please wear comfortable shoes and be prepared to stand for the duration of the exhibition as there is no seating. There is no designated parking but street parking is readily available in the vicinity. You must purchase your tickets on-line prior to the event.